When we first saw its face in a Italian ad, more than one Engadget editor called its bluff: "The top half doesn't line up with the bottom," some said, "that's got to be Photoshopped." While that early image was indeed CG, the form factor was certainly not -- the new Xbox 360 sports enough sleek angles and disappearing curves we've taken to calling it the Stealthbox. As mother always told you, though, it's what's inside that counts; does that glossy exterior house any improvements, or is it hiding just another Xbox? Find out after the break. Dimensions 10.6 x 2.95 x 10.39 in. 12 x 3 x 10 in. 11.5 x 3 x 10 in. Though the new unit and all its accessories are technically labeled "Xbox 360 S," you'll never hear Microsoft marketers call it a Slim, and it turns out there's a pretty good reason for that. While the new Xbox 360 is 18 percent lighter, it's only a quarter-inch slimmer than its predecessor at the waist, and is practically the same width as the old unit measured at its widest point. 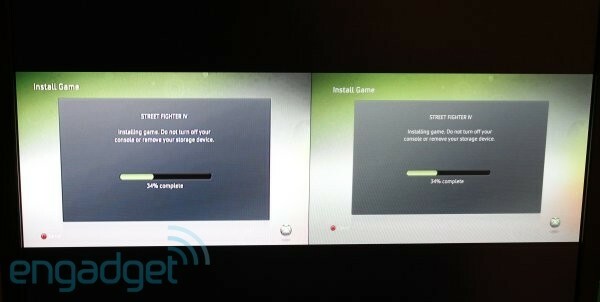 Even as its stature has decreased 12 percent, the new Xbox 360 is deeper than the Elite. See the gallery below for comparison shots, but you can basically think about it this way -- Microsoft's taken its rectangular console and molded it into a square. Perusing the outside of the unit, however, there are a number of pleasant surprises in store, including a dedicated optical audio jack (though the one embedded in older A/V cables works just as well), capacitive touch buttons and a snazzy new hard drive port. 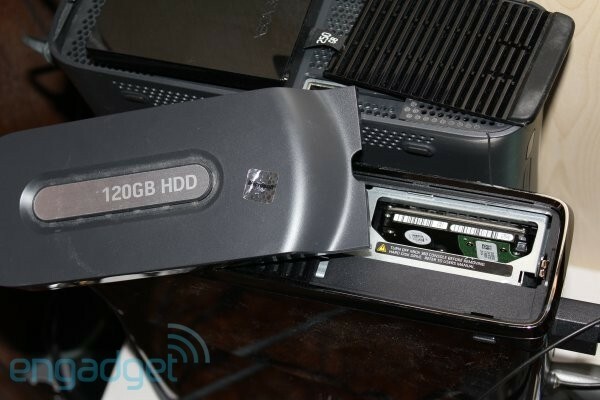 Since Microsoft's April firmware update brought USB mass storage to the console, we knew the life of Microsoft's proprietary Memory Unit was running out, and sure enough the new Xbox 360 loses the MU sockets in favor of two additional USB ports. Sadly, the extra USB are in the rear, right next to the Kinect port, so they'll be little use for plugging in Rock Band instruments if you house the system in a cabinet. Not that you'd necessarily want to leave it in a cabinet... but more on that later. On the bottom of the system you'll find a removable panel housing the unit's hard drive. As before, the embedded 2.5-inch SATA unit isn't user replaceable, but this time we rather admire its plastic shell -- it's a handsome cartridge that slots neatly inside the system, surrounded by a fully cushioned cage that both silences and protects the hard drive. Capacitive touch buttons aren't everyone's cup of tea, and it seems odd to see them here after Sony finally phased them out, but Microsoft's implementation removes the uncertainty usually associated with touch by immediately responding to input. Both power and eject buttons play a chime as soon as your finger connects, and the DVD tray slides out far quicker than in Sony's slot-loading system. Just in case you're wondering, the new disc drive does not protect discs from nasty scratches this go around -- dropping a Savage Garden album in the tray and letting the console flop to one side (on a carpeted surface, no less) our album was truly, madly and deeply cut. The console itself may be an attractive package, but Microsoft really skimped on the extras this time round. While we didn't expect the new wireless controller to add anything more than a coat of gloss black (sorry, fighting fans, it's the same ol' D-pad), we're surprised you don't get HD playback out of the box. Where the Xbox 360 Elite came with not only a switchable component / composite HD A/V cable but an HDMI cord to boot, the new Xbox 360 has only a set of composite wires that don't support even 480p resolution. If you expected the new Xbox 360 to be any faster, you're mostly out of luck -- the silicon's clocked at the same speed, for starts, and the 250GB hard drive was neck and neck with the Elite's 120GB during a battery of tests, like this 4.6GB Street Fighter IV install. The new Xbox 360 sadly doesn't have gigabit ethernet to speed networking up, but we did get favorable results out of the 802.11n WiFi card. Compared to a 100 megabit wired connection on a neighboring Elite, the wireless posted slightly more erratic transfer rates and was occasionally susceptible to lag, but still averaged 1.7MB / sec downloads (compared to 1.9MB / sec) on a fast AT&T U-Verse connection -- we'd certainly be happy with most games (save fighters) over wireless. 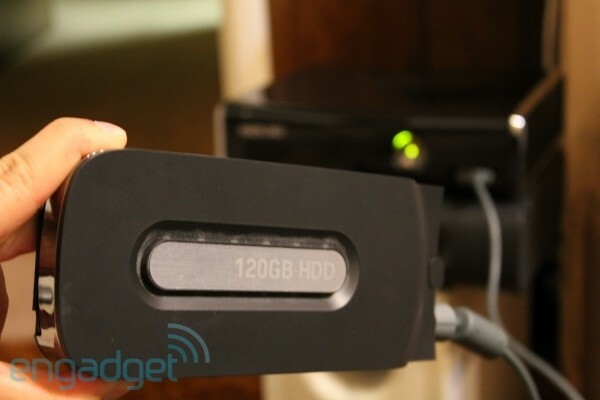 The one place the new Xbox 360 did show considerable improvement was the optical disc drive -- the Stealthbox consistently loaded DVDs and game levels two seconds faster -- but we'd hesitate to recommend the system on that basis alone, as historically Microsoft has shipped consoles with a variety of different drives. We'd already heard the new Valhalla was pretty dang power-friendly, but that didn't keep us from performing a few tests of our own -- and sure enough, it's the most energy efficient unit we've seen. While it still draws a tad more current than a PS3 Slim, playing games and DVDs require fewer watts, and as you can plainly see in the chart above, it wipes the floor with our Elite. The Stealthbox is just as "whisper quiet" as Microsoft promised, too -- though it's definitely audible when playing games from DVD, the system's blissfully silent as long as you first install them to the hard drive. The only thing amiss was the electromagnetic signature we detected when firing our infrared temperature gun -- you'd think that using less energy, the console would generate less heat, but our unit was often burning hot to the touch. Given Microsoft's storied history of hardware failure, we'd never think of leaving an Xbox in a cabinet or stacked with other A/V components and that hasn't changed one bit with this model. If you're buying an Xbox for the very first time, data migration won't concern you in the least, but on the off-chance you're thinking of springing for a new system you should know that things have changed for the better, and we thought we'd include this brief guide. There are now three ways to move your data over, assuming you don't want to download it all again: USB, the transfer cable, or by simply sticking in your old hard drive. 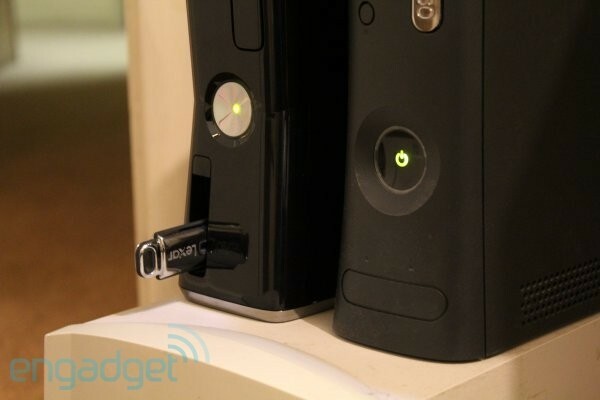 USB is the cheapest way to move content by far -- just insert an USB thumbdrive or external HDD, and the Xbox can partition up to 16GB worth of storage. Thing is, you can't move savegames and DLC a la carte, as your profile always has to come along for the ride. If you've only got a small USB key, it could take ages to ferry everything over. The Xbox 360 Hard Drive Data Migration Transfer Kit (yes, that's seriously the full name) makes things easier, as you can move an entire drive's worth of content in one fell swoop, but it costs $20 at retail. Thankfully, Microsoft made these practically disposable a few years back in what used to be single-use transfer kits, and you can find the now-bidrectional cables for pennies on eBay. Last but not least, as we just discovered, you can simply rip open your old Xbox 360 hard drive and slot it into the case, at which point it will be immediately recognized. Needless to say, we don't recommend this route for a variety of reasons... we hear Microsoft's warranty support service doesn't take kindly to freely bouncing hard drives. The new Xbox 360 is a sleek, stylish contraption, shiny black from head to cords, but it doesn't offer quite enough to make it an obvious upgrade for those who've bought one before. If the screeching cries of your existing unit are driving you up the wall, or if you need a more energy efficient system with integrated wireless, sure, but if you've already invested in the Xbox ecosystem, purchased add-on hard drives and more, you'll find little to justify the $300 price -- until your existing console throws the dreaded RRoD, or perhaps an E74. That said, this is the best Xbox 360 ever made, bar none, and if you've yet to join the Xbox party -- and don't mind springing for an HDMI cable -- this is definitely the one. Update: While our Xbox 360 Elite came with HDMI and component A/V cables we've been informed that Microsoft has since stopped shipping HD-capable cables with new Elite models. We have updated the comparison chart to reflect that.